Roger Bisby tries out another tool/machine designed for use with the Milwaukee 12 Ah High Output range. 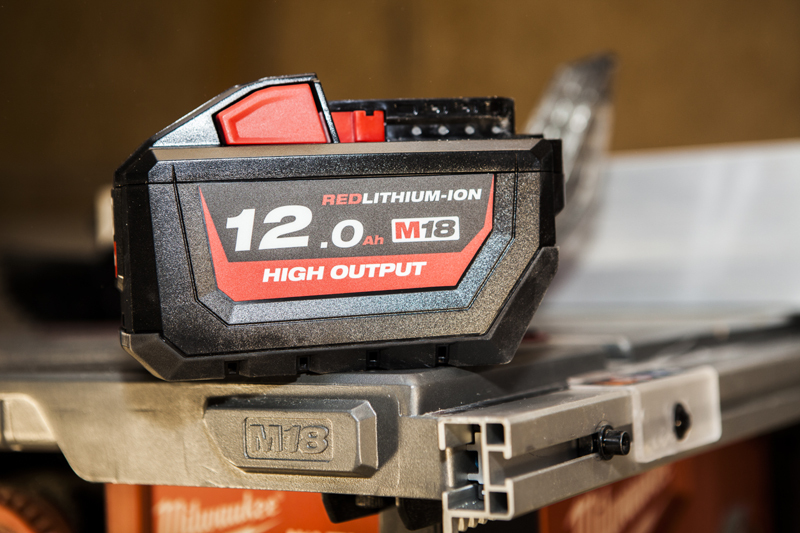 Last year we introduced the Milwaukee 18 volt 12Ah High Output Battery and used it in the manufacturer’s heavy duty reciprocating saw. The larger cell size produces the kind of power that was previously only available by plugging into the mains. There is no compromise on power, so much so that Milwaukee feels there is no need to go down the mains inverter route. We are now following that review up with another power tool that is well matched to the 12Ah battery. Milwaukee says that this saw is equivalent to a 15 Amp mains powered machine and, having used it for two months, I don’t doubt it. It has a wide enough fence to allow you to cut an 8×4 sheet straight down the middle. 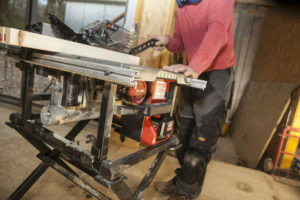 Actually, this is the least useful application because these days everyone but Milwaukee has a track saw which does this job far easier than having two people, or some roller stands, to run 8×4 sheets through. One of the benefits of sticking with the 18 volt platform is that you can use your existing batteries, but given the size and power of this machine you might be thinking that your 5Ah Milwaukee batteries would not actually be a lot of use. Happily, we found it did very well on the lower Ah batteries so, while your 12Ah is recharging, you are not down and out. However, when you start running 4×2 through the extra power comes into its own. This machine has so much more to offer than grunt and, for my part, it is a second fix machine which has great portability. The rack and pinion fence (much loved by DeWalt fans) produces a nice parallel precision cut, and is good for ripping down door linings when using CLS framing. You can also do some nice arris rail on it as it bevels up to 48 degrees. Thanks to a canvas cradle that prevents saw dust dropping out of the bottom, the dust management is as good as it gets. It has to be said that a lot of people would not hook this cordless saw up to a cordless dust extractor, so the ability to spew the vast majority of the dust out into a bucket at the back is a great asset. Place a sheet over the bucket and it gets even better. The keyless change on the riving knife and anti-kickback prawls are nice refinements, and everything can be stored on-board so, when you pack up and wind the blade down, you finish up with a compact unit that allows you to stack other boxes on top. Milwaukee’s One Key lock out security tracking system comes as standard on this machine, and means that nobody else on site will be able to use it – and it is also useless to a thief. You can also track the machine and get a read out on where and how it is being used. That is more useful for those running fleets. Actually it would have been useful to me to know where that 12Ah battery went because somehow it walked away and I had to buy another one to complete the test. It is undoubtedly the most expensive battery I have ever bought but a man’s gotta do what a man’s gotta do and it certainly packs a punch. Given that we still have to look at the chainsaw and circular saw I will be getting some use out of it. You never know, the original one might turn up if the person who pocketed it has an attack of conscience.